The center of our activities is Taos and vicinity in north-central New Mexico. From our inception in 2012, Renewable Taos has worked closely with Kit Carson Electric Cooperative, Inc. (KCEC), the local utility that provides electricity throughout this area. KCEC Service Territory & Communities Served. Click here for a larger version. KCEC’s Service Territory is an area roughly the size of the state of Delaware. It borders on Colorado to the north, and includes all of Taos County and small parts of Rio Arriba, Colfax, and Mora Counties. KCEC distributes electricity to approximately 29,000 customers throughout this area. Following the adoption of Renewable Taos’ Joint Resolution on Renewable Energy throughout KCEC service area communities, we began to expand our connections to other New Mexico Rural Electric Cooperatives (RECs). We began working with the adjacent Jemez Mountains and Mora-San Miguel RECs in 2015, and since have expanded our outreach to RECs throughout New Mexico and Colorado. 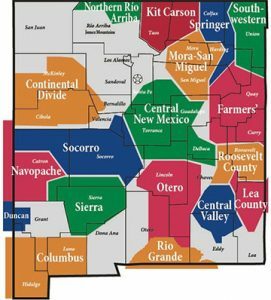 This map shows the 18 Rural Electric Cooperatives (RECs) in New Mexico that are members or associate members of the New Mexico Rural Electric Cooperative Association (NMRECA). Click here for a larger map and links to information on each REC shown. 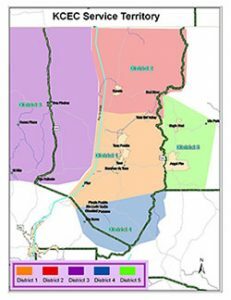 Jemez Mountains Electric Cooperative, Inc. (JMEC) is not a member of NMRECA and is not depicted on this map. JMEC serves most of the large area of northwestern New Mexico shown in gray in the upper left part of the map. JMEC is the largest REC in New Mexico in terms of members served. 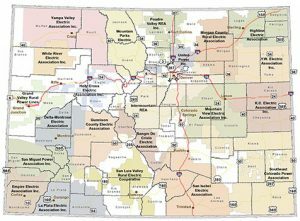 Rural Electric Cooperatives (RECs) in Colorado. Click here for a larger map and detailed information on each REC. In addition to our activities with RECs, Renewable Taos members also travel to Santa Fe and Albuquerque NM for meetings with our Congressional Representatives, NM Legislators, the New Mexico Public Regulation Commission (NMPRC), and State and Federal agencies involved with decisions on generation, transmission and distribution of energy throughout our region. We work in Colorado in the Denver offices of Guzman Energy, the wholesale electricity provider for KCEC, the National Renewable Energy Laboratory (NREL), in Golden, CO and the Rocky Mountain Institute (RMI) in Boulder, CO.